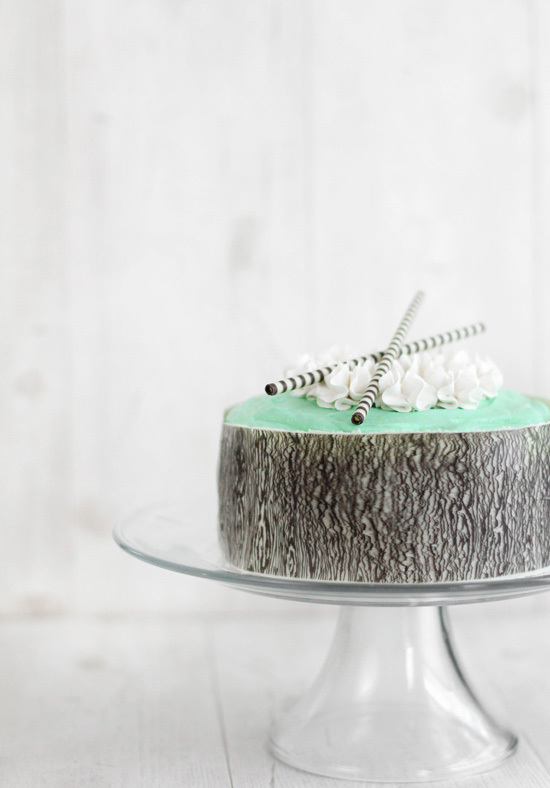 Mint-White Chocolate Mousse Cake and a Book Trailer! 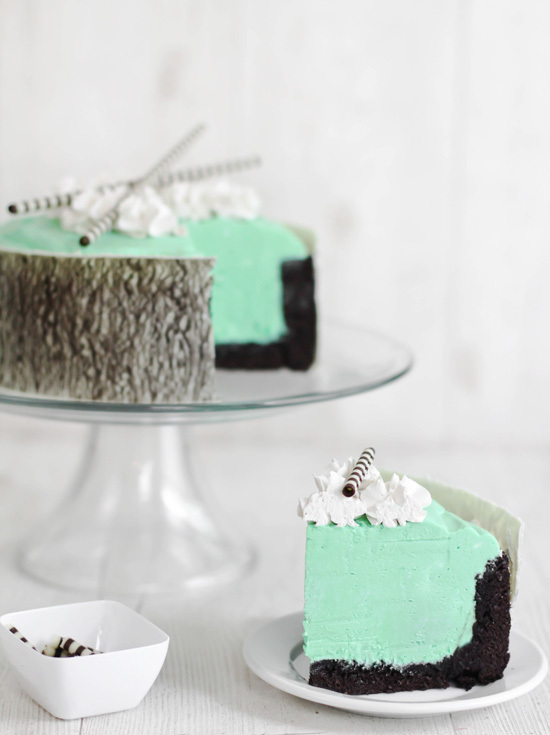 Before I get to the details of this cool minty mousse cake, I'd like to introduce you to someone. This is my friend, Morgan. She's pretty much my favorite photographer in all the land. She makes me look cute in pictures. Trust me -I don't always look cute in pictures. I recently asked her if she'd be interested in helping me put together a book trailer. Now, this was no small request and I was afraid she's say no, but she didn't! (You can read her recount of this here). One Saturday last month, she drove from her home in Alabama to my home in Tennessee and we got started. It's definitely not the expected book trailer, which is usually presented in an earnest tone and with mentions of accolades -and there's nothing wrong with that! In fact, that's what we had in mind at first, but my editor (the best editor in all the land, ahem...) asked, "where's the fun?" 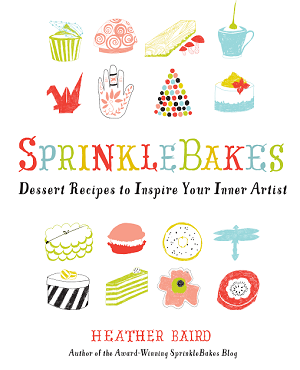 Very lighthearted, very SprinkleBakes. - thank you Morgan! 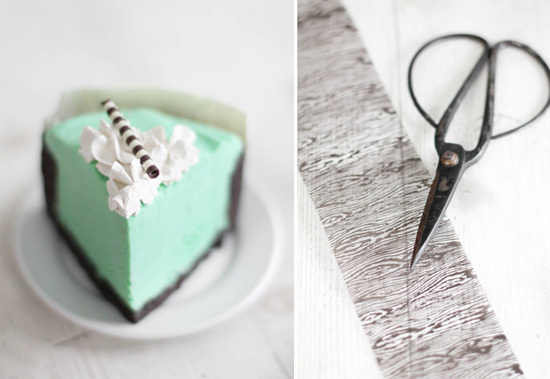 Morgan is a mint-and-chocolate fanatic, and I felt it only fitting to make something she'd love for this post. 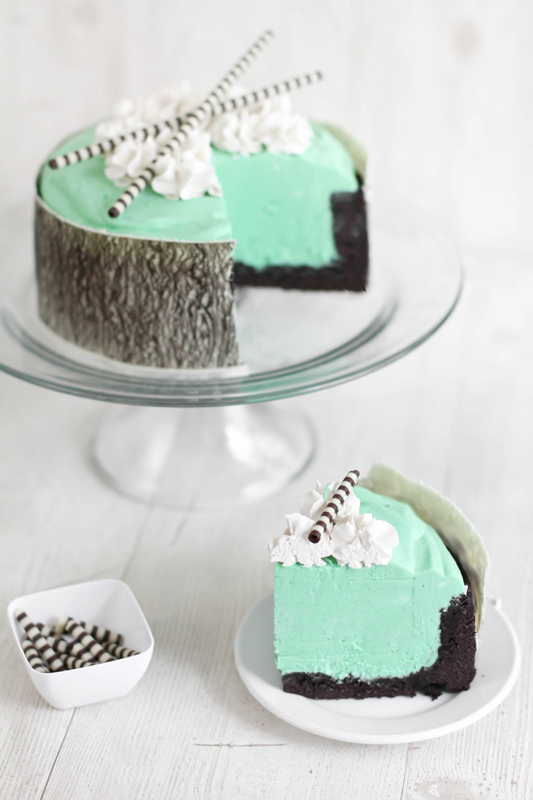 Dark chocolate joconde sponge cake is filled to the brim with mint-white chocolate mousse; a true mint-lover's nirvana! At the last minute, I decided to use a chocolate transfer sheet that had been languishing in my pantry for months. I should have used it earlier, as the pattern was a little unstable, but I still really love the results. Looking for chocolate transfer sheets? You can find them here. The striped chocolate cigarettes are made by Dobla, and I found them at World Market. If you need some how-to's on putting this cake together, see my Crown Jewel Cake tutorial on how to line the pan with joconde. Also see my Chocolate-Honey Cake for tips on applying the chocolate transfer sheet. Preheat the oven to 450°F..
Line an 11.5 x 17-inch jelly roll pan with parchment paper. Using a stand mixer fitted with the paddle attachment, beat the almond flour, confectioners’ sugar, all-purpose flour, whole eggs, and egg yolk until combined, stopping to scrape down the sides of the bowl as necessary. In a separate bowl, whip the egg whites with an electric hand mixer. When the egg whites are foamy, gradually add the superfine sugar until a white, shiny meringue forms. With a large rubber spatula, gently fold the meringue into the almond-flour mixture. Add the melted butter and gently fold again, being careful not to deflate the batter. Bake for 5 to 8 minutes or until the cake springs back when pressed in the center. Remove from the oven and let cool slightly. Invert the cake onto a sheet of parchment and carefully peel away the parchment paper. 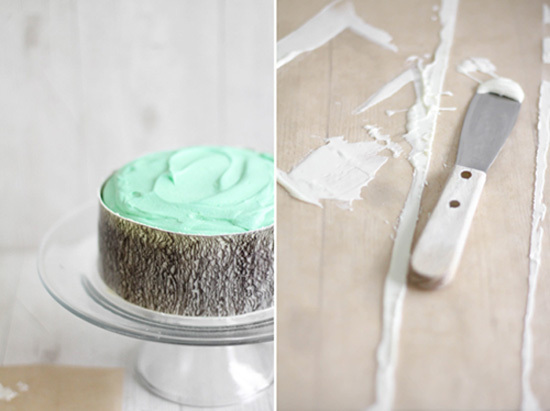 Trim the edges of the cake with a serrated knife. Set aside. Have ready a 7” springform pan. Trim edges and cut one long piece of joconde big enough to fit around the inside of the 7" springform pan. You may have to piece together with a small portion of cake to line the entire circumference of the pan. Using the bottom of your pan as a guide, cut a circle of cake from the joconde and press it into the bottom of the pan evenly (you may need to trim the circle slightly for it to fit perfectly). Set joconde-lined pan aside. If you're not interested in making this entire cake, this mousse recipe can be made and poured into a parchment-lined loaf pan. If you go this route, be sure to thoroughly chill before turning out onto a serving plate; slice into individual servings. Creme de menthe can be used to taste in place of the mint extract. 1 1/2 cups whipping cream. Place 2 tbsp water in a medium saucepan and sprinkle gelatin over water. Let stand for 1 minute. Whisk in egg yolks and sugar; mix well. Stir in hot milk. Cook over medium heat, whisking constantly. Cook until thickened considerably 7-10 minutes. When done, it should be thick enough to coat the back of a spoon. Stir in melted chocolate and blend with a whisk until chocolate has melted and even in color (no streaks!). Let cool. When mixture has cooled somewhat, stir in mint extract and green food coloring. Whip cream until stiff peaks form. Gently fold whipped cream into the cooled chocolate-mint mixture until well blended. Pour as much of the mousse as possible into the joconde lined pan; smooth the top. (you will have a little mousse and joconde cake left over. I suggest making a single-serving trifle). Place mousse cake into the freezer for 2-3 hours, or until firm. Remove from freezer and remove cake from springform pan. Measure side of joconde cake and cut the chocolate transfer sheet to size. Melt white chocolate chips in the microwave at 30 second intervals until smooth. Let chocolate cool slightly, then spread onto the chocolate transfer sheet with an offset spatula in one or two even strokes. Allow chocolate to harden then peel away the acetate, revealing the patterned chocolate. Pipe whipped cream in a florettes in the middle of the cake (I used Wilton #133 tip). 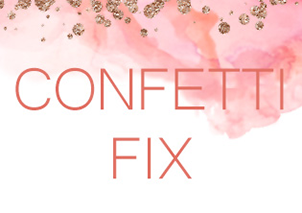 Decorate with chocolate cigarettes, curls or shavings. Serve frozen or allow cake to thaw in the refrigerator and serve cold. Keep uneaten portion wrapped in plastic wrap and store in the refrigerator or freezer. A gorgeous cake! So pretty. The video is awesome and both you and your dog look cute. Aww Heather!! That video is absolutely adorable! Love Biscuit's cake. I can not wait for your book to come out. I'm so excited!! Also, love this mousse cake....could you be any more creative?! Love it! That is adorable. Super super cute. And the cake looks amazing, as usual! 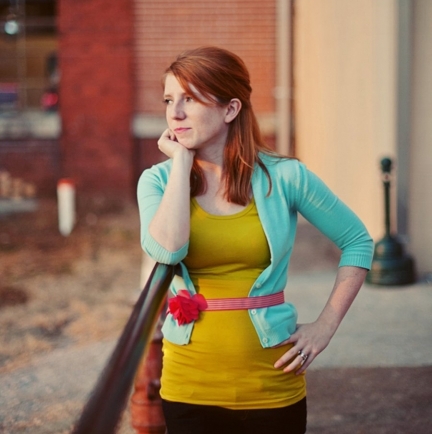 Heather, your site makes me happy. It is my favorite. Your desserts truly are little works of art. Thank you for the joy you bring. amazing! this cakes is so pretty! The cake looks fabulous and so do you. OMG how cute!! I absolutely adore your book trailer! :) And, I'm in love with this cake! Mint chocolate is my favorite! SO excited for your book to come out... yay!!! You just blow me away...first you compile the perfect recipe and then it turns out looking gorgeous and cuts into perfect little triangles. So talented! I love the book trailer and always enjoy seeing your photographs. I LOVE LOVE LOVE the trailer! HOw stinking adorable is Biscuit! Can't wait to get your book!! Love the trailer, it's so cute! Cake recipe also looks delicious. Where did you buy the chocolate straws? What a great decoration! Love the trailer and you are gorgeous, Heather! Congrats, again, on your book coming to life...this has got to be so exciting for you! I love it! I especially love how you go out your front door and end up on your mom's front porch!!!! Biscuit is just too, too creative. Love you! OMG...adoro sus pasteles y tortas como siempre espectaculares ,una gran decoración me encanta,abrazos, hugs,hugs. It's my front porch Susan. And if you think it's my mom's front porch, then obviously I'm doing something right! She keeps hers immaculate - mine? Not so much. Wow, this cake just looks so delicious - such great flavors, and such a dramatic color! Yum! what a great photo of you. who did your hair? can they do mine? i have a lot! OK first of all your beautiful friend morgan makes you look cute because you ARE SO STINKING CUTE anyway :) and the video is so fun! Aw love the Biscuit video!! What a great video! Biscuit is too cute :) Also, love your purple and orange dress! I teared at how adorable it was, beautiful trailer! So cute! omg the video is FANtastic! So creatine. Totally cracked up at Biscuit turning the book pages. 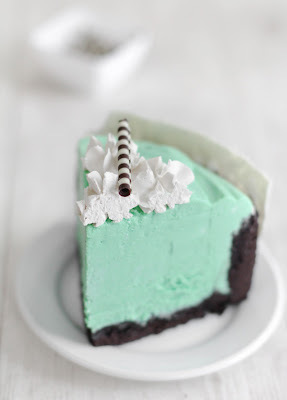 I love mint and want to dive into that gorgeous creamy green heaven. Yum! I am BEYOND in love with the book trailer. It captures you so PERFECTLY, my sweet friend. I cannot WAIT to get your book...it will be treasured until the end of time!!!!!!!!! Oh....goodness gracious. this cake looks absolutely AMAZING. AH-MA-ZING!! gorgeous, gorgeous, & YUM. i simply love mint! Wow this cake is beautiful! It's perfect for Easter! That video was amazing! I can't wait for your book!! I have never seen anything so sweet in my life. Biscuit must be indeed your biggest fan, mascot, and taste tester. Bravo! Beautiful cake and adorable trailer! So happy for you, Heather! As always, your recipes are masterpieces. The trailer is awesome! So well done, so clever, and your pup makes me smile. I cannot wait to buy your book. I have to look and see when it comes out. Congratulations! I know the book will be a hit. 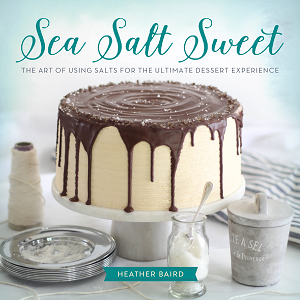 Congratulations Heather on your book. What an adorable idea with the trailer and Biscuit. And the recipe - well, right as I finish up the last of my chocolate mint Girl Scout cookies you come up with the perfect treat to take their place. This looks so good, lovely and delicious... Congratulations and thanks for another gorgeous recipe! the cutest book trailer I've seen in a long time! Love the originality in the book trailer! I hope Biscuit gets to accompany you on any upcoming book tours! This white chocolate mousse cake...amazing! Such a beautiful cake. I bet if I tried it would look nothing like that! Cool video trailer (cute dog too). Awesome recipes on this site. If the cake was not outstanding enough the book trailer was amazing too - fantastic I can't wait to see the book I just heop they ship to the UK! you're absolutely beautiful! 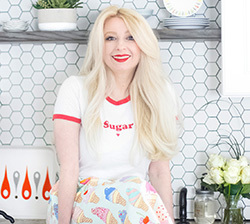 Your princess hair is to die for, not to mention your stunning stunning recipes. I just spotted this on Pinterest and thought to myself... I will cry if I cannot find the original source. please don't be Tumbler. What a relief when I found it was you! This is one of my favorite masterpieces of all time. I love the video. Glad Bisquit got his way for the love of pugs! Great job Heather & Morgan too! 3 talented people in this post! You, Biscuit, and your trailer, could NOT be any cuter!!! CANNOT wait for your book! This cake is a beauty! Such a cute video!!! And I would love to make this cake, esp in hot weather. :) It looks SO FLAWLESS. This is my first time here and I am TOTALLY staying! Your site is beautiful and I don't think you could look anything other than cute. Congratulations on your book. Your video is adorable and this cake looks amazing! Love the cake + love you!! How could anyone take a bad photo of you ~ Heather you are gorgeous!! Your blond hair is amazing. This cake is stunning too. Gonna watch the trailer right now! Video ~ AMAZING!!!! OMG: Biscuit bakes too?? You guys are such the team. Can't wait to get your book......soon yes?? You made me smile this morning when I watched Biscuit! The head tilt of pugs is the best. Love them! 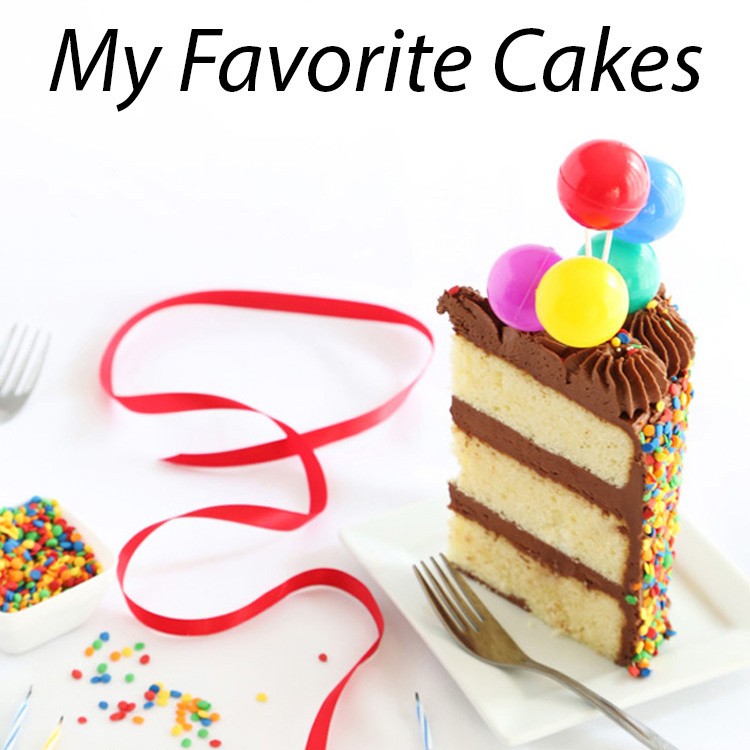 What a stunningly beautiful cake - not to mention my favorite flavors. Yum! The colours are so pretty! I think my sister would love this! Love it all - cake, video...! Can't wait to get my hands on your book!! Heather! ACK!!! I LOVE your book trailer! Totally, totally unique and fun and adorable! I am excited to try this recipe, one question, in the instructions you mention to take the cake out of the oven twice (step 7 and 9) would you be able to clarify that for me? thanks! Thanks for asking! I omitted the "remove from oven" in step 9. It was a typo. I hope this helps! Best of luck with the cake. Today was the first time Ive seen any of your recipes, thanks to Pintrest, so I came to your site to get a closer look and fell in love with you right away !!!!!! YOU HAVE A PUG OMG OMG OMG !!!! Im Pugmama !!!! I love those little guys and I have two little girl Pugs. So besides being a great cook, I can tell your also a great person !!! Im looking forward to trying out some of your recipes !!!! Hi Kiki - they are the same! For an artist who loves color - your use of B&W for video- thru Biscuit's eyes & inner artist - Verrry clever, my dear! Congratulations! I ordered your book and it finally arrived...Its absolutely beautiful and I can't wait to bake my way through it! Your book is definitely a must have! Is there a way to make the mousse without gelatin? I really would love to make this cake, but most of my friends are vegetarian and would not be able to eat the gelatin. What a beautiful cake especially the mint color mousse. Looks yummy!! 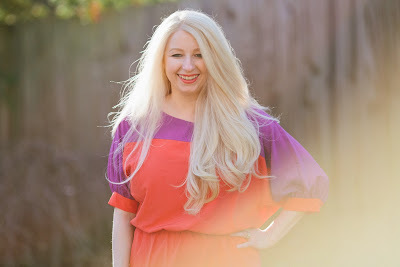 You have a fantastic blog!! Best regards from Greece!! This look amazing! I have to try this.. Thanks for sharing-) The best! you actually need to sort your priorities out. What are you even doing with your life... you are pathetic. ps. mint chocolate is delightful. Your work is amazing. I could look and look for hours and never get bored. So glad I found you through instagram! I am very excited about this cake and am in the process of making it for my family for Christmas dinner. However following the recipe is a bit challenging as there are a few errors. When do we add the coco and should we melt the chocolate before adding it to the pot or melt it in the pot with the other ingredients? Other than the errors it looks super cool and I am excited to taste the finished product! I want to make this so bad. I absolutely love mint and chocolate! Wow this looks amazing! Chocolate and mint are the best together!! I'm only 12 years old and my friend and I are making this cake for a project at school. I hope it turns out good!